In the life of each band there is such a time when they want to sum up their previous work, to wind up a certain period in history or to just earn some money. Clan of Xymox, the Dutch cold sound legend, also have encountered such a situation. This best-of reached me a bit late as generally, such publications are not to my taste, but this one is quite special. Firstly (and most importantly), it is not a simple set of songs from different albums presented chronologically or at random, but something much more thought of and consistent, keeping in suspense as a "regular" album - turning on "shuffle" spoils the atmosphere, while on ordinary compilations there is not much difference. Secondly (and importantly as well), to achieve coherence, most of the tracks were re-mixed or even recorded in 2004 (the year before publishing the album), thanks to which none of the tracks is different stylistically or (what's more important) on a different level of production. Frankly speaking, only two tracks from two last studio albums COX - Notes from the Underground and Farewell escaped processing. Thirdly and finally - the whole period signed by the shorter name Xymox was omitted - this controversial decision is explained by Ronny Moorings in the note added to the CD, where he writes that it was a period of search that ended with an ascertainment that what had been doing with Clan of Xymox was closest to his heart and what he had always aimed at that. Moreover, it was enforced by the fact of the album's sound unification, which I mentioned above. In the same note Ronny also explains the way the album is constructed – from each COX's studio album 2 songs were chosen, and from the last one Farewell three were chosen in the fans' voting (all of them very good, which contributes to the album's value). 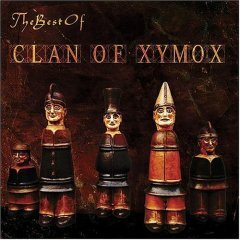 To sum it all up - Clan of Xymox is a band whose each album has been an important musical event and a point of reference for the generation of new bands, including those in Poland. Publishing The Best Of they satisfy both the old fans, serving new versions instead of the already known, neither spoiling them nor making them sound weird, and at the same time they create a very comfortable starting platform for the potential new fans - it's a very practical and easy to follow guide presenting the band's achievements. I sincerely recommend it to the old and new fans alike!